*Please beware... we DO NOT advertise or rent our home on Craigslist, someone is placing false ads on Craigslist. The Hale Anna is a beautiful, private home located across a quiet street from miles of sandy beach. The main living accommodations are on the upper floor of a two story home with ocean and territorial views including Haleakala. This residence contains a three bedroom home and swimming pool. The home will comfortably accommodate up to 6 guests (including children). The house has 3 bedrooms. The master contains a standard king bed, the second a California king bed, and the third bedroom contains 2 twin size beds. The main living area is open and contains a fully stocked kitchen, dining room, and living room. Large decks face the ocean and Haleakala, plus contain an outdoor eating area with stainless BBQ. You can watch the sun both rise and set. AC is installed in the main living area and 2 bedrooms. There is an amazing private pool and deck. There is ample seating and lounge chairs. The deck was replaced with TREX decking. The home is located in a residential neighborhood. This property is perfect for families. 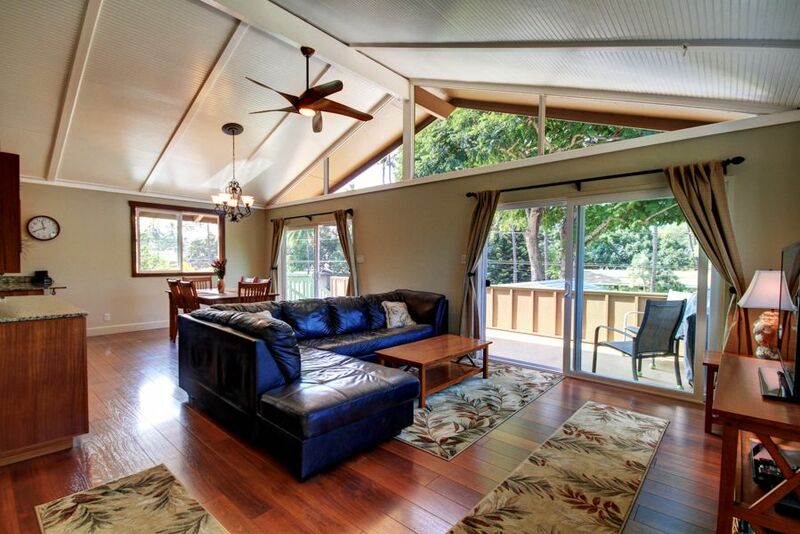 The quiet hours on Maui County are from 9pm - 8am, this home is not a party home but perfect for families. -Minimum 6 month stay required. -Maximum occupancy is 6 guests including children. -QUIET HOURS ARE FROM 9PM-8AM (POOL HOURS 9AM-7PM): The Hale Anna is located in a quiet residential neighborhood and Guests must be aware and respectful of neighboring properties at all times. Noise carries at night and although guests are on vacation, our neighbors are not. Please be sure that ALL the members of your group are aware of the quiet hours and will be able to comply BEFORE booking this property. The home is fully equipped and you will enjoy the on-site caretakers! Aloha! We are the Peterson family! The Hale Anna has been in our family since the late 70's. Families have enjoyed this property for over 30 years! We are the on-site caretakers and are here to swap out the propane tank in the BBQ for you, maintain the pool, and take care of any issues that may arise! We have an 12 year old son, who is very lucky to grow up on Maui! If you will be travelling with kids, we have great recommendations of things to do. It is a beautiful home and property and we look forward to welcoming you! The Hale Anna is in a great central location. Kihei is very convenient to all Maui has to offer. There are amazing beaches within 5 minutes of the house. If you are in the mood for rest and relaxation the Hale Anna has it all. A private pool and lanais with amazing views. We strive to maintain the house and property to amazing standards. Plus 2 seats at kitchen bar.